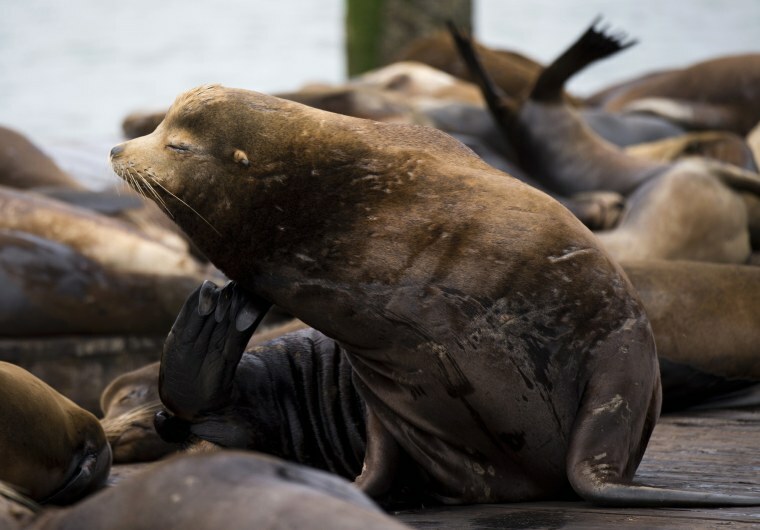 WASHINGTON — A toxin produced by marine algae is inflicting brain damage on sea lions along California's coast, causing neurological and behavioral changes that can impair their ability to navigate in the sea and survive in the wild, scientists said on Monday. Brain scans on 30 California sea lions detected damage in the hippocampus, a brain structure associated with memory and spatial navigation, in animals naturally exposed to the toxin known as domoic acid, the researchers said. Domoic acid mimics glutamate, a chemical that transmits nerve impulses in the brain, and leads to over-activation of hippocampus nerve cells and chronic epilepsy, according to Emory University cognitive psychologist Peter Cook, who worked on the study while at the University of California-Santa Cruz. "The behavioral deficits accompanying brain damage with domoic acid are severe, and may negatively impact foraging and navigation in sea lions, driving strandings and mortality," Cook said. Hundreds of sea lions annually are found stranded on California beaches with signs of domoic acid poisoning such as disorientation and seizures. Thousands are thought to be exposed to the toxin. The microscopic algae, called Pseudo-nitzschia, responsible for the toxin occur naturally in coastal waters. Their blooms have become more frequent and severe in recent years. This year's bloom was the largest on record, reaching from Santa Barbara, California to Alaska. Ocean pollution from chemicals like fertilizers and warming ocean temperatures associated with global climate change are believed to contribute to bloom size and frequency. The toxin accumulates in shellfish and small fish that consume algae. Sea lions, other marine mammals and seabirds are exposed to it after eating those shellfish and fish. "Domoic acid-producing blooms have been in the environment for a very long time, but the current pattern of much larger and more frequent blooms causing more visible damage to marine animals has been going on since the 1980s," Cook said. Sea lions exposed to the toxin had greatly reduced connectivity between the hippocampus and the thalamus, a brain structure associated with sensory perception and regulation of motor functions. Those with hippocampus damage also performed worse on memory tasks such as one involving finding a food reward. "Hundreds of sea lions end up in stranding facilities each year. A great many of them do die although some can be rehabilitated and survive for some time in the wild," Cook said.